We are all going to grow old some day, if we are lucky enough to maintain relative good health. We may not make it to the age of 98, like Mary Tony, who is the subject of the video you are about to watch below. When you finish watching this heartbreaking video, it will give you pause, to think of elderly people you know who may be facing the terrible loneliness that Mary suffers. The title of this video is “Junk Mail”, because when Mary is not at the senior center that she enjoys immensely, she has nothing to do and no one to talk to. She lives alone and no one comes to visit. She confides in the person interviewing her that “[she] has to do something or [she'll] go nuts” so she cuts up junk mail, puts it in a bag and throws it away. 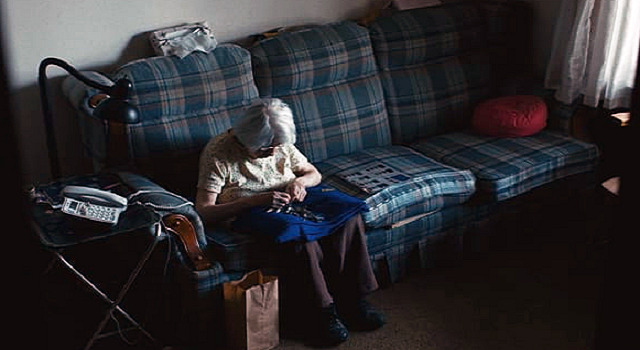 Mary's story is not unlike many of the elderly who are ignored at the end of their lives. It is such an important reminder, of the impact of the difference made by a simple visit, every so often. Mary was so overwhelmed by a visit organized by the senior center, that she was brought to grateful tears, saying “I love you all for coming..it's made my day and I'll never forget this”. Please SHARE Mary's story with your family and friends on Facebook.